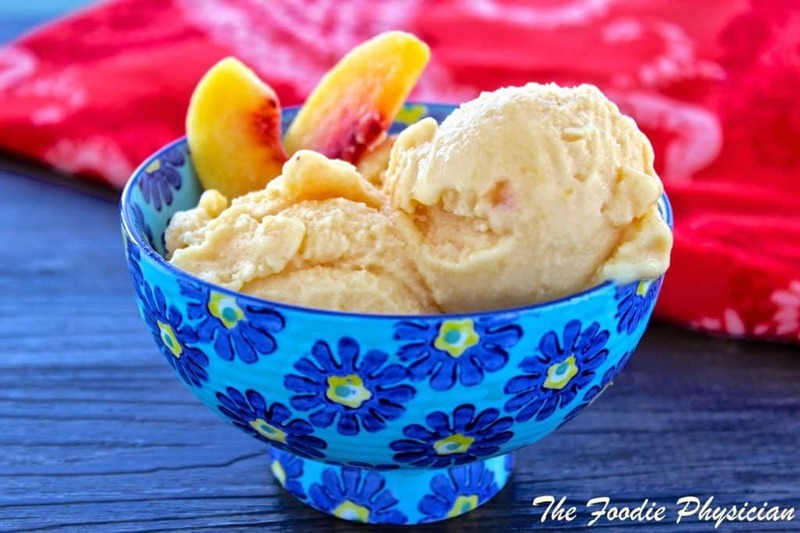 Your family will love this luscious, creamy Super Fast Peach Frozen Yogurt and it only takes five minutes to make! A couple of weeks ago I posted a One-Ingredient Banana Ice Cream recipe- a quick and easy ice cream recipe using only fresh bananas. Since then I’ve been on a quest for more healthy dessert recipes. Let’s face it, it’s hard to find easy, guilt-free dessert recipes that also taste great. That’s why I’m really excited about my Super Fast Peach Frozen Yogurt. This delicious treat simply involves putting frozen peaches, Greek yogurt, honey and a bit of lemon juice into a food processor and blending until smooth and creamy. You only need five minutes and the end result is a creamy, luscious treat that the whole family will love. It’s hard to believe it’s so easy to prepare- no ice cream maker needed. Peaches supply a rich dose of Vitamin C as well as a good amount of several other nutrients like fiber, Vitamin A, potassium and niacin. Along with the peaches, I also use Greek yogurt. You may have heard that I’m a big fan of Greek yogurt and have a book out now called The Greek Yogurt Diet. Greek yogurt adds a creamy texture along with a boost of protein, calcium and probiotics, which are beneficial for your digestive health. To read my blog post about the health benefits of Greek yogurt, CLICK HERE. I prefer my frozen yogurt on the tart side so I sweeten mine with only a small amount of honey. You can use your sweetener of choice and adjust the amount to your taste. Eat it right away if you prefer the texture of soft serve frozen yogurt. If you like a firmer texture, freeze it for a couple of hours first. You can also try this recipe with other fruits like strawberries or mango. This dish is a great one to make with your kids. They’ll love how quickly it comes together and you’ll love how good it is for them! Your whole family will love this creamy, luscious treat and it only takes five minutes to make! Place all of the ingredients into the bowl of a large food processor. Blend, scraping down the sides occasionally, until it forms a creamy, smooth mixture. This should take about 4-5 minutes. At this point the frozen yogurt can be served and will have the texture of soft serve. For a firmer texture, transfer the mixture to a freezer container and freeze for an hour or two before serving. Thanks for your comment, Denise! I hope you enjoy my recipes! I just love how simple this is to make! I actually have all the ingredients on hand!! Can't wait to try ;). Thanks, Min! I hope you like it! I happened to have some ripe peaches and I tried your recipe. It was so simple to make and we too liked the slight tartness. I will try it with fresh mangoes. So glad you liked it! Using mangos sounds great! Thanks Farrah! I hope you enjoy it if you give it a try! Sonali, you are amazing for posting this recipe- Being in the peak of Summer here, there's only so many slow cooker recipes I can handle. How many cups is 16oz of peaches? Excited to make this recipe! Thank you for sharing. Love following you on Instagram.